Retail facilities include small stores, discount and variety stores, department stores, convenience centers, strip malls, regional shopping malls, and multiple-use complexes. They may be stand-alone operations or part of a larger facility. Retail stores may be located along business streets in cities and in strip and major malls in the more suburban areas. They range from small owner operations which are usually undercapitalized, to franchises prescribing certain of their operational limits, to chains with firm headquarters control over energy system designs, specifications, and operations. Walmart typifies the latter. This segment covers small retail and department stores. The selection and design of HVAC systems for retail facilities are normally determined by economics. First cost is usually the determining factor for small stores; for large retail facilities, operating and maintenance costs are also considered. Generally, decisions about mechanical systems for retail facilities are based on simple payback or a cash flow analysis rather than on a full life-cycle analysis. Small stores often have large frontal glass areas which could result in high peak solar effects (except for north facing stores). High heat loss can also occur on cold, cloudy days. This portion of the store should be designed to offset these higher cooling and heating requirements. Entrance heaters may also be used in cold climates. There are even exterior load and air balance considerations in the shopping mall stores with interior facing glass, especially where the intent is to keep the store doors open to encourage traffic. Obviously, the interior loads are similar whether the store is alone or within a mall. Department stores vary in size, type, and location. 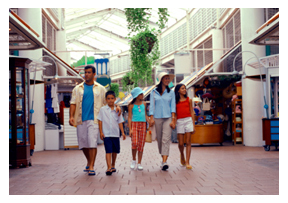 Each store should have an air- conditioning system design that meets its particular needs. Sufficient outdoor air must be supplied to minimize or eliminate odor problems. Basic features of a quality system include (1) an automatic control system to handle changing loads, (2) main sales areas zoned for air distribution to maintain comfort conditions with varying loads, and (3) use of an economizer system for cooling during intermediate seasons and peak sales periods. Design the system to maintain relative humidity at 50% or below with a corresponding dry-bulb temperature of 78°F. This humidity limit eliminates musty odors and retards perspiration, particularly in fitting rooms. It is also desirable to adjust indoor temperatures for variations in outdoor temperatures, to avoid temperature shocks as customers enter and leave the store. Winter humidification is seldom used in store air conditioning. Small Stores Single-zone unitary rooftop equipment with prefabricated and matching curbs simplify installation's common in store air conditioning. The use of multiple units to condition larger stores involve less ductwork and can maintain comfort in the event of partial equipment failure. These HVAC units may be either heat pumps or gas heating/electric cooling packages. This equipment is air-cooled and has a low first cost and ease of operation, which readily adapts them to small-store applications. Water-cooled cooling equipment is available for small-store air conditioning, but many communities have restrictions on the once-through use of city water and require the installation of a cooling tower or other water-conserving equipment. Water-cooled equipment generally operates more efficiently and economically, but higher first cost with a tower and higher maintenance limits its application. Retail facilities often have a high sensible heat gain relative to the total heat gain and equipment should provide the necessary sensible heat removal. The external static pressures available in small-store air-conditioning units are limited, and duct systems should be designed to keep duct resistances low. Duct velocities should not exceed 1200 fpm and pressure drops should not exceed 0.10 in. of water per 100 ft. Average air quantities range from 350 to 450 cfm per ton of cooling in accordance with the calculated internal sensible heat load. Department stores may use either unitary or central-station air-conditioning systems. Large department stores often use central-station systems consisting of air-handling units having chilled water cooling coils, hot water heating coils, fans, and filters. Air systems must have adequate zoning for varying loads, occupancy, and usage. As there are wide variations in people loads, variable volume air distribution systems are often used. The water chilling and heating plants distribute water to the various air-handling systems and zones and may take advantage of some load diversity throughout the building. Air- conditioning equipment should be located in ceiling, roof, and mechanical equipment room areas whenever practicable. The noise and expense are less than when placed in the sales area. Maintenance and operation of the system are important considerations in the location of equipment. Larger stores may contain restaurants and lunch counters. These special areas may operate during all store hours. They may be met by the portion of the air conditioning system serving or by a separate air-conditioning system. The restaurant is often used only during the noon hours. For control of odors, a separate air-handling system should be considered. Older inefficiency cooling and heating systems should be investigated for upgrading or replacement, particularly if CFC refrigerants are used. Add Economizer cycles if they are not installed or in use. Upgrade antiquated or inappropriate control systems. Water heating is not a major energy user with uses typically for hand washing and cleaning purposes. Most water heating is done separately from the building heating system using direct resistance or gas heaters, and in some cases, point-of-use heaters. Larger stores may use central distribution systems with storage and constant recirculation where it is desirable to have hot water available continuously at the fixtures. Larger stores may contain restaurants and lunch counters. Their cooking needs should be handled as appropriate. Larger stores may contain restaurants and lunch counters, or specialty departments that require refrigeration. Their refrigeration needs should be handled as appropriate.